Justin’s note: Election Day is tomorrow, and many Americans will spend the day hemming and hawing about the results… Wondering what it all means for the political landscape going forward. But not us here at Casey Research. While we accept that politics now play an unfortunate role in the financial markets, our mission is to look past the noise and unearth the best money-making opportunities behind it all. And today’s essay from Crisis Investing chief analyst Nick Giambruno is a prime example. Tomorrow’s midterm election is shaping up to be one of the most consequential in years… But not for the reasons you’re hearing about in the mainstream media. I’m referring to the “green wave” of cannabis legalization. While the media is largely distracted with the national political circus, presidential and midterm elections are often a chance for people to vote on other issues pertaining to their state… like cannabis legalization. On November 14, the U.S. government is holding a special auction – one that could unlock an internet with speeds 100 times faster than anything we have right now. This innovation could add $10 trillion to our economy by 2020. 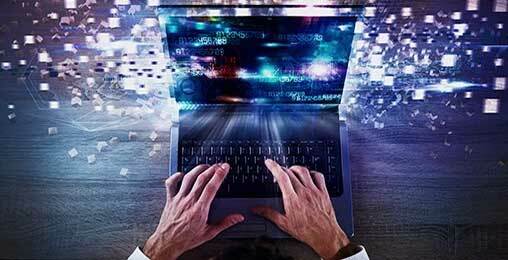 And it could send the share prices of three key companies soaring – by the end of this year. To date, 31 states (plus Washington, DC) have legalized medical marijuana. And nine states (plus DC) have approved recreational use. And soon, several other states could be added to that list. Four states will vote on cannabis legalization in some form or another tomorrow. Michigan and North Dakota will vote on whether to legalize recreational use, while Utah and Missouri will vote on allowing medicinal use. This reflects attitudes toward marijuana across the U.S., which have undergone a radical change in recent years. Today, 66% of Americans say cannabis should be totally legal. That’s the highest level of support since polling on this issue started 49 years ago, as you can see in the chart below. And it’s more than double what it was in 2000. As a point in comparison, when Canada fully legalized cannabis earlier this year it had the support of 68% of Canadians. That puts the U.S. within spitting distance of what it took to fully legalize in Canada. 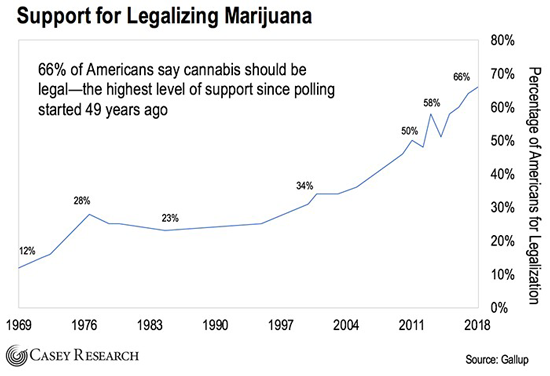 Support for cannabis legalization in the U.S. is bipartisan. A majority of Democrats (75%) and Republicans (53%) back it, according to the latest Gallup poll. In fact, cannabis legalization has been a big feature in countless Democratic primaries, most prominently in New York. New York Governor Andrew Cuomo, who used to oppose legalization, said the “facts have changed” around marijuana. Cuomo now supports legalization and is moving New York in that direction. Earlier this year, Chuck Schumer, a powerful Democratic senator from New York, introduced S.3174, the Marijuana Freedom and Opportunity Act. This bill would decriminalize marijuana at the federal level. But it’s not just the Democrats. A growing number of Republicans already think cannabis should be legalized. Take former U.S. House Speaker John Boehner. In 2009, the former Ohio congressman said he was “unalterably opposed” to legalization. But earlier this year, he joined the advisory board of Acreage Holdings, a U.S. investment firm focused on marijuana. The polls have radically changed. Cannabis legalization is a winning issue, and both parties recognize that. That’s why I think 2018 will be remembered as the year the “green wave” broke the will of legalization opponents. And it’s just one of the reasons why I’m convinced President Trump has no choice but to legalize cannabis. Like I said earlier, 31 states (plus Washington, DC) have legalized medical marijuana. Nine states (plus DC) have approved recreational use. And tomorrow, Michigan, North Dakota, Utah, and Missouri will vote to legalize cannabis in one form or another. States’ rights matter to Republican voters, and cannabis is part of that theme. This is probably one of the reasons why Trump indicated his support for the Strengthening the Tenth Amendment Through Entrusting States (STATES) Act. The bill would amend the federal Controlled Substances Act to exempt state-legal marijuana activity from its provisions. It would also protect banks that work with legal cannabis businesses. In short, the feds would stop bothering the marijuana industry in states that have legalized it. This would open the door further for Big Business and Big Money to move in. 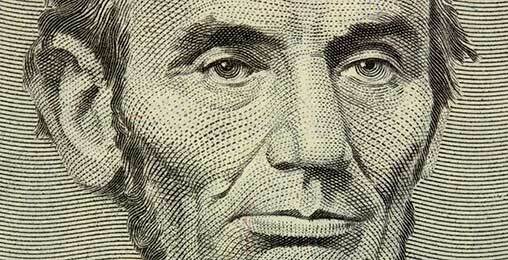 Everyone knows about slavery, but few realize Lincoln made another controversial ban in 1863… That’s when Honest Abe arguably put an end to “honest money.” Today, 13 U.S. states could soon reverse Lincoln’s ban. And Teeka Tiwari, America’s #1 currency expert, recently explained what’s going on and what it means for your savings. President Trump has publicly berated U.S. Attorney General Jeff Sessions on Twitter for months. He’s criticized Sessions more than any other member of his government – for everything from the Russia investigation to immigration. Sessions is a stubborn drug warrior. He once called marijuana “slightly less awful” than heroin. And earlier this year, he rescinded the Cole Memo, giving the federal government more leeway to crack down on the cannabis industry in states that had legalized it. When this happened, I told my readers there was no question Sessions’ move would backfire. But even I didn’t realize how big the backlash would be. Democrats and Republicans in states with some form of legal cannabis universally condemned Sessions. None of the federal attorneys – who report to Sessions and would be responsible for executing a crackdown – showed any enthusiasm. Instead of hurting the cannabis industry, Sessions galvanized political support for legalization. This culminated in the STATES Act. And like I mentioned above, even President Trump chimed in at that point. Neither Sessions nor any other federal official has lifted a finger against the U.S. cannabis industry since. The whole episode revealed that there is no political appetite to crack down on cannabis. Medical cannabis could be a significant factor in reducing harm from opioid abuse. Drug overdoses are the No. 1 cause of accidental death in the U.S. Over 60% of these deaths were from opioids, most of them prescriptions like hydrocodone and oxycodone. Unfortunately though, many of the opioid prescriptions in the U.S. are made for things like back pain and other common conditions where opioids may not be the best option. The truth is that, in many cases, there’s a much safer alternative to using opioids to treat pain: cannabis. It’s no secret cannabis has incredible medical benefits… including effectively treating chronic pain. Cannabidiol (CBD) – a chemical compound found in cannabis – is particularly useful as a painkiller. In fact, unlike opioids – which only mask pain – CBD can help fight pain and minimize inflammation. In many ways cannabis is more effective than opioids, yet it remains totally illegal at the federal level. The potential for addiction with cannabis is far less than it is with opioids. And it’s practically impossible to overdose. There’s never been a single cannabis overdose death… ever. According to a comprehensive study from the Rand Corp., there was a 20% decline in opioid overdose deaths in states with legal medical marijuana. A recent study published in JAMA Internal Medicine had similar findings. Trump has already declared the opioid crisis a “national public health emergency.” He seems genuinely dedicated. If he’s serious about addressing the problem – and I think he is – he’ll have to acknowledge the role cannabis can play as part of the solution. That can only further erode prohibition. Unfunded public pension liabilities in the U.S. are surging. They’ve surpassed $5 trillion. And that’s during an epic stock and bond market bubble. It’s no coincidence these states are looking for new sources of revenue, like cannabis taxes. Just look at what happened in Colorado, which legalized recreational use in 2012. By 2017, cannabis sales had more than doubled to $1.5 billion a year. That’s about $250 million in tax revenue for the state. A decade ago, Colorado was receiving zero dollars in marijuana taxes. Notably, cannabis sales in Aspen now exceed liquor sales. Then there’s Washington state, which generated over $200 million in cannabis-related taxes in 2017. After four years, that number is expected to exceed $1 billion. And in California, a recent study estimated that cannabis taxes would bring in at least $1.4 billion each year. In many of the states that have or will legalize cannabis, the tax revenue will exceed that of alcohol and tobacco. That’s not something a cash-strapped state can turn away from. In short, the more states that legalize cannabis, the less practical it becomes for the feds to roll it back… And the dream of prohibitionists further fades. That’s why, if you haven’t yet, now is a good time to position yourself in the top U.S. cannabis companies. P.S. The legal marijuana market is one of the biggest ground-floor investment opportunities I’ve seen in my career. That’s why I’ve spent the last year and a half building a portfolio of nine best-in-class legal cannabis companies for my Crisis Investing readers. Tomorrow’s election is just another catalyst that’ll propel these companies higher. And they’re all screaming buys today. To learn how to get these names in your portfolio… and ride the “green wave” all the way to nationwide legalization… click here. After reading Durk’s thoughts on gold last Thursday, I feel a little silly having bought some gold. One of the things to keep in mind about these central governments is that they control much of the tradable gold, they can print money, and they can buy gold with the printed money. Justin, I believe making money on a product that will be a detriment to our society is unethical. I am a Christian woman, widow of a United Methodist minister, and a mother of two children. I have two beautiful grandchildren. I am concerned for their future as well as the future of our nation and world. How can I justify making money on a product that potentially may cause the end of our society as we know it? Many people make money illegally from drugs now, how has that gone? Just because marijuana is legal doesn’t mean it is right. I would rather die poor than live rich on someone else’s possible addiction. Marijuana is a drug! I feel the same way about liquor, cigarettes, and anything else that may cause the body harm. I do not claim to be perfect, but I do believe that God is saddened by all this. This, I’m sure, is not his plan for humankind. Thank you for letting me express my opinion. Relatively new to CBD use and have already experienced health benefits. I plan on purchasing stock but am finding it difficult to zero in the best stocks to buy. Tools to produce CBD, growers of hemp, or direct sales of CBD? Justin’s reply: Thanks for your note, Betty. We at the Casey Research office like to use The Marijuana Index – an online encyclopedia for marijuana stocks – to get a broad view of all the opportunities out there. That’s a good place to start your research. Also, as Nick mentioned above, Crisis Investing members rest easy knowing that they own the best diversified cannabis companies in the space… In fact, one of his picks has soared as much as 619% since his initial recommendation. To learn how you can become a member, click here. Readers… Do you think that cannabis is as dangerous as other vices and not worth profiting on? Or is it time to invest in this emerging trend? Let us know where you stand – along with any questions or suggestions for the Dispatch – at [email protected].